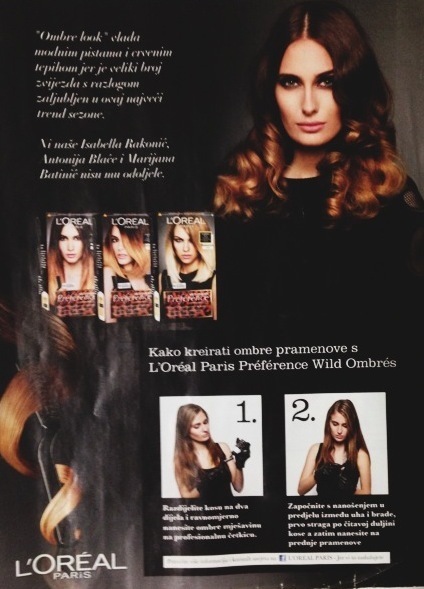 About a month ago I was invited to try out the new L'Oréal Paris Préférence Wild Ombré hair colour. The tricky part was that we actually had to do it ourselves. I never coloured my hair at home so I was scared it's not going to come out right. Surprisingly it did, and it turned out even better then I expected. New Wild Ombrés is so easy to use. The application brush will apply the lightening crème solely to the desired area of your hair to create the ultimate catwalk worthy dip dye look / two tone effect. You just have to carefully follow the steps and choose the right colour! photos from V magazin and Storybook. been wanting to try the ombree look too but I chicken out. hmmm this is pretty. Wow, it turned out insanely well. You look gorgeous! gorgeous, what ombre did you get? No 1? when i want darker hair i want my hair ombre! wow you look like a hollywood star!! Draga I, tvoja boja je super i odlicno ti stoji. Ali, mene zanima da mi kazes koju boju je koristila Marijana jer je moja pribliznija njenoj.